Hi iv had this bear since I was a child as long as I remember unsure to if he originally belonged to my big sister or was actually my Dad's childhood bear who was born in 1961 ? 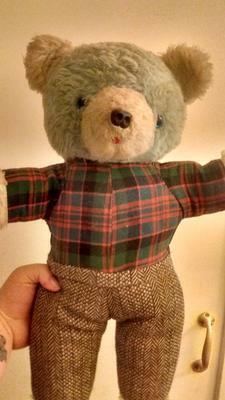 He has no labels on him soft white stuffing yet his body feels very firm, blue plastic eyes with black pupil, plastic detailed nose , a small red tounge, tweed rough feeling trousers & checked shirt which is all attached to him they don't come off (he's been made that way). Just looking to see if anyone knows what kind he is or his maker an what year/how old he is..I'm 31 an think he's older than me lol, thanks in advance.